There is a sinister force that is corrupting American politics by giving the most environmentally destructive elements of Big Business significant control over state legislatures. The American Legislative Exchange Council (ALEC) turns 40 this year. This organization is composed of large corporations and state lawmakers. They draft environmentally harmful model laws that have been adopted in state legislatures across the country. ALEC describes itself as “nonpartisan public-private partnership” and is registered as a not for profit organization. While the organization enjoys 501(c)(3) tax-exempt status, many groups see it as little more than a front for one of the most powerful and influential lobby groups in America. The threat to America’s democracy from ALEC should not be underestimated as this is a well-funded and well-coordinated organization that has a proven track record of successfully manipulating state legislatures. According to a new report from the Center for Media and Democracy (CMD), ALEC continues to hold sway over statehouses across the country. In total, CMD identified 466 ALEC bills that were introduced in state legislatures during the first seven months of 2013. At least eighty-four of these measures have become law. As reviewed in PR Watch, ALEC’s real mission in state legislatures is, “to allow dirty energy companies to pollute as much as they want, to attack incentives for clean energy competitors and to secure government handouts to oil, gas and coal interests,” says Connor Gibson, a Research Associate at Greenpeace. One of the most egregious threats to the public interest comes from the fossil fuel industry’s involvement with ALEC. “Disregarding science at every turn, ALEC is willing to simply serve as a front for the fossil fuel industry,” says Bill McKibben, co-founder of 350.org. Corporate sponsors of ALEC include the leaders of the fossil fuel industry. Companies like Koch Industries, ExxonMobil, Duke Energy, Peabody Energy, BP, Shell, Chevron, TransCanada and American Coalition for Clean Coal Electricity, as well as industry trade associations and large corporate foundations provide almost all of ALEC’s funding. ALEC’s goals are clear, they seek to provide financial rewards and protections to the companies that they work with. ALEC supports some of the most destructive fossil fuel legislation ever tabled including bills supporting coal, fracking and the Keystone XL Pipeline project. It should come as no surprise that TransCanada Corp., the company that wants to build the Keystone XL pipeline, is also a member of ALEC. The company even sponsored an expense-paid trip called “ALEC academy” for nine ALEC-member state legislators. Following the trip, some of those in attendance introduced resolutions backing the pipeline in their state legislatures. According to CMD, 77 ALEC bills promoting fossil fuels and undermining environmental protections were introduced in 34 states in 2013. At least seventeen of these measures have become law. ALEC’s activities extend beyond support for fossil fuel interests and encompass climate change misinformation. The Environmental Literacy Improvement Act which passed in at least four states, teaches children that climate change is a “controversial theory.” (The truth is that with 98 percent support, there are few theories that have garnered more support from scientists than anthropogenic climate change). 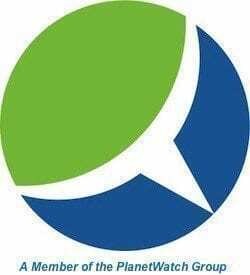 ALEC is a leading organization that actively denies the veracity of anthropogenic climate change and opposes limits on climate change causing emissions. At the 2013 meeting of ALEC, climate change was one of the items on the agenda. One of the speakers at this year’s ALEC meeting was Joe Bastardi, he is a leading climate change denier and television weather forecaster who frequently comments on Fox News. He has called human-caused global warming an “obvious fraud.” This year, Bastardi was the speaker at a plenary breakfast meeting misleadingly titled “A Thoughtful Approach to Climate Science.” In 2011, he spoke about “The Many Benefits of Increased Atmospheric CO2” at ALEC’s annual meeting. As reported in a May 2013 Forbes article, Bastardi says that “blaming turbulent weather on global warming is extreme nonsense.” While many have speculated as to whether he is willfully ignorant, willful, or just plain ignorant, as a meteorologist Bastardi should know better. ALEC does not only work in support of dirty hydrocarbons, it also is working to snuff out renewable energy. “ALEC’s long time role in denying the science and policy solutions to climate change is shifting into an evolving roadblock on state and federal clean energy incentives, a necessary part of global warming mitigation,” says Gibson. Through legislation called the Electricity Freedom Act, ALEC sought to prevent states from requiring energy companies to increase electricity production from renewable energy sources. Because the Electricity Freedom Act failed to gain the support of state legislatures, ALEC is modifying its plan of attack against renewable energy standards. At its August 2013 meeting, ALEC introduced a bill called the Market Power Renewables Act, which seeks to undermine the Renewable Portfolio Standard or RPS. ALEC has drafted laws that seek to oppose state efforts to reduce emissions. This includes a model bill titled, “State Withdrawal from Regional Climate Initiatives”, which opposes limiting climate change causing carbon emissions. ALEC bills have not only opposed efforts from state agencies to regulate pollution, they even tried to stop the federal Environmental Protection Agency (EPA) from regulating greenhouse gas emissions. In essence, ALEC’s goal is to undermine emissions reduction efforts and to continue our reliance on fossil fuels. Resistance to limiting atmospheric CO2 represents a serious threat to global health as it is widely understood that failure to reign in carbon emissions will have catastrophic consequences. An ALEC bill titled “Environmental Services Public-Private Partnership Act” would give for-profit companies control over wastewater treatment and drinking water. Another ALEC law titled “Disposal and Taxation of Public Lands Act” would give states access to resources in federal lands that are protected as wilderness preserves. In addition to promoting anti-environmental bills, and seeking control over resources, they also craft legislation to control information and help industry escape public accountability. ALEC’s Animal and Ecological Terrorism Act would quash the First Amendment rights of reporters, investigators and videographers by making it harder for them to document issues associated with food safety and animal cruelty. This is similar to Utah’s ag-gag law of 2012, which led to charges against a young woman named Amy Meyer, who filmed the outside of a slaughterhouse from public land. This ALEC model bill could also criminalize environmental civil disobedience. Click here to view the full list of 2013 bills from the ALEC Energy, Environment, and Agriculture Task Force bills. The American public is increasingly aware of ALEC’s activities. As ALEC gathered for its 40th annual meeting in Chicago on August 7, they were met by protesters who marched outside the Palmer House Hotel where the meeting was held. The thousands who demonstrated included environmentalists, union members, civil rights activists, and social justice campaigners. Although this was not the first protest against ALEC, it was the largest to date. Groundbreaking news coverage has helped to expose ALEC. Some of the most inclusive coverage of ALEC was provided by the CMD in the 2011 piece titled “ALEC Exposed.” Another was a documentary from Bill Moyers & Company titled “United States of ALEC”. 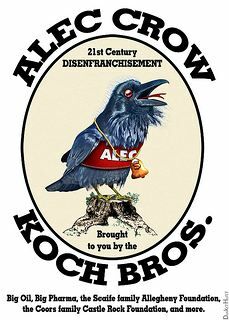 One of the ways that ALEC has managed to wield so much power is by virtue of the fact that they have always functioned in the shadows. However, people are increasingly coming to terms with the nefarious ways in which ALEC threatens democracy and efforts to combat climate change. The normally clandestine activities of ALEC are no longer hidden under a blanket of secrecy. Companies are increasingly understanding that involvement with ALEC is a PR liability. Already, there have been a number of big multinationals that have withdrawn from the organization. Over the past year-and-a-half, almost 50 global corporations have dropped their ALEC membership and national campaigns are encouraging others to abandon ALEC. After four decades of covert operations, ALEC is starting to feel the pressure from public scrutiny. Although ongoing resistance can be expected from the fossil fuel industry, public awareness can divest ALEC of its influence over state legislatures. Shinning a spotlight on ALEC’s activities will kill the succubus that is draining the lifeblood of America’s democracy.